If you are serious for your SAT journey, you should know vocabulary is extremly important to get high score. In general, your preparation classes or tutors do not focus on vocabulary because they cannot improve it in a short or easy way for each student. As a matter of fact, methods, tricks, and even grammars are just about dozens of rulers. You need know them to shoot good score. However, if you hope to be better, you have to build a stronger vocabulary that costs your time but bring you honor. This is a hard job for teachers, students, and even parents. Your budget is time, and target is future. 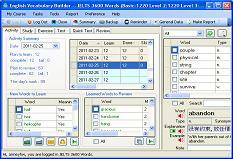 Here, English Vocabulary Builder will show you a great solution that thousands of learners have proved. It contains 3600+ words that most likely appear on SAT. It has been developed and maintained by a group of SAT experts who are intimately familiar with the words used to create the test. These words are categorized into 3 levels for separate levels. Never try to collect SAT words by yourself or input a list downloaded from unknown internet websites. It seems simple but wastes your time and even leads you a wrong direction. 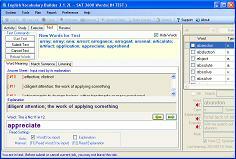 English Vocabulary Builder is an interactive product for learners who can add new word, write own notes for each word, or update explanations and example. It traces all studying activities and offer report mechanism to let student, parent, and teacher know how the course goes. Its plan functionalities support to estimate time cost and adjust progress and content. Basically, it is designed not only for students but also for tutors to work together. Never try a tool just like a dictionary. You do not know where you get and where you go and none can help you out in case you are stuck. You might be thinking that such a superior solution would cost much more than other vocabulary programs. And indeed, we believe it is better business to offer a superior product that everyone can afford. 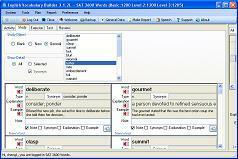 Download English Vocabulary Builder 3 for SAT FREE! Users with account of examword.com can activate the tool and load level 1 FREE! Users request level 2/3 register keys just when need them! They are FREE too! If you've already looked at other programs, you'll know that this is a great deal. And if you haven't looked at other programs yet, allow us to save you time. You may find a school (or tutor) to help your vocabulary building, or you may find software to help your vocabulary building. Our solution is probably the unique one to let you share study status with tutor.